THE NATIVE NORTHWEST STORY Native Northwest's story began over 35 years ago with a social worker, a rack of postcards in a basement, and the vision of celebrating First Nations and Native American arts with the world. We are inspired by the living cultures of the Pacific Northwest and across North America. Our company office is honoured to be situated on the majestic Fraser River within Musqueam (Coast Salish) territory in Vancouver, B.C. The values behind our brand originate with the founding reason for the company: Native arts and cultures, designed by Indigenous artists, propelled by commerce for a social purpose. Each of our exchanges, from the sourcing and compensation of Indigenous artists, to our staff and merchants, are part of a lifelong relationship between Indigenous cultures and the communities we pledge to honour and respect. Our evolution to a social and business enterprise is ongoing. We thank you for joining us in the journey that lies ahead. Follow our story online. facebook.com/nativenorthwest instagram.com/nativenorthwest nativenorthwest.com Do you receive our email updates? 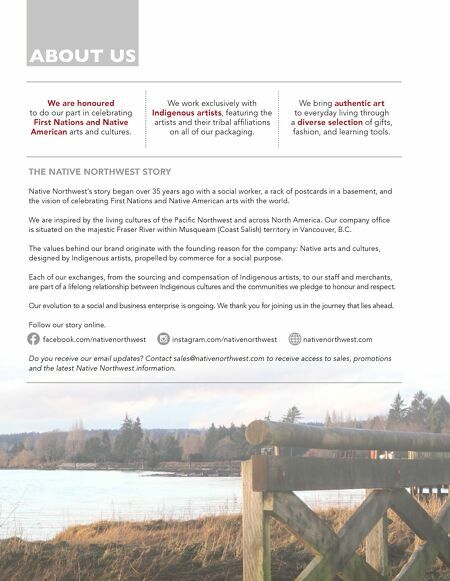 Contact sales@nativenorthwest.com to receive access to sales, promotions and the latest Native Northwest information. 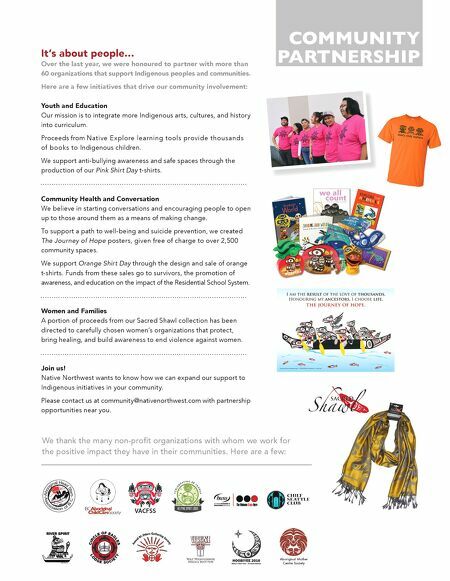 ABOUT US We are honoured to do our part in celebrating First Nations and Native American arts and cultures. We work exclusively with Indigenous artists, featuring the artists and their tribal affiliations on all of our packaging. We bring authentic art to everyday living through a diverse selection of gifts, fashion, and learning tools.